Having stayed in India for the past week, I couldn’t help but notice one trait of India’s people, and that is the calmness in the storm of mechanical chaos. With over 8 billion people populating this giant metropolis which is chennai, you will find it hard to maneuver your way around all the different bodies. This includes the bodies of cows, humans, and stray dogs. 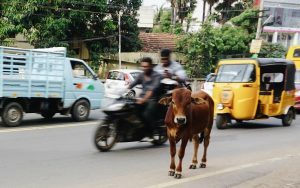 Countless times I would be yelling in my head, or out loud as our rickshaw driver barely squeezes past a car, honking his horn, and pushing on with blind faith that others will abide to his honk allowing him passage. In the US drivers will honk out of frustration and anger, but ironically in Indian a honk is more for letting others know you are there. A honk in India is more so a passive honk not an angry honk. According to the Cambridge Dictionary zen means to be relaxed and not worry about things you cannot change. I titled this zen traffic because I truly believe that one must act with, “direct vision” as the hindus would call it, or with the calm focus to effectively drive in India’s traffic. One moment of hesitation, or one wrong move could lead to a disastrous wreck, and a giant hold up for the others sharing the road behind you. Ive experienced this many times when crossing the street. You must also be zen when standing in still traffic, or crossing the road. When standing in still traffic, in an auto rickshaw, you will be close to many other vehicles inevitably breathing in fossil fuels. This may seem uncomfortable, or even miserable, but you must be zen and not let it effect your vision of the surrounding beauties of India. Crossing the street for many areas might seem like a nightmare for some, but in order to effectively cross without getting hit you must stay calm and act with a focused goal. Hesitation will cause you to freeze up, and will leave you exposed for cars who do not have the time and patience for your fears. Many of my peers who put there heads down and cross with confidence will make it across unscathed and without worry. Those who second guess there nature will generally be the most susceptible to getting in an accident. Cows are another huge obstacle as well. They’re big, and stand mindlessly in the road. If you hit a cow then likely everyone around will hit you. This is because of the strong faith that accordances with hinduism in this country. A driver must be patient and let the cow pass, or give the beast the right of away. Cows are reincarnated humans, not food! All in all the people driving in India can really teach you something. In order for chaos to seamlessly move on it needs as much least resistance as possible. This, results in thousands of mindful Indians on the road patiently allowing any quagmire to untangle itself. This patience only comes with the mindset of zen to allow seamless malleability to the surroundings of chaos. This is true adaption in adversity. Photo taken by Emma Wetenhall.